Pals is the most famous inland village on the Costa Brava, often frequented by coach trips from the bigger resorts like Tossa or Llorett to the south. 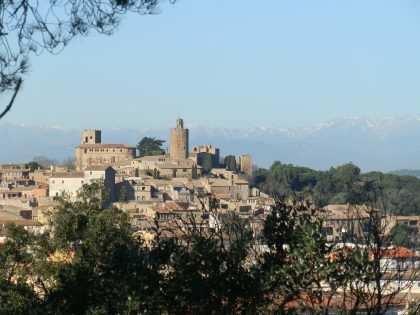 The village is medieval and stands on a low isolated hill surrounded by levels (used for growing rice) and consequently stands proud above the surrounding countryside. The village itself is a collection of narrow streets and arches that wind their way to the church and lookout tower at the top of the town. There are quite a few recommended restaurants in the town and nearby and every year Pals holds a festival de arros (rice festival). The levels around the town come about because at least until the middle ages, much of the surrounding area was either sea, or a sea-etang/marsh area. These have been drained, or the sea has receded, to leave rich fertile flat plains with plenty of available water from the river Ter. This walk starts in Regencos. Regencos is also an old village of about 50-100 houses and a church. 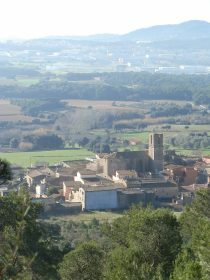 Most people would follow the road as it bypasses the village heading towards Begur and never stop in Regencos itself. Behind Regencos is a small hill called Quermany (pronounced Querman) which is only about 220 metres high, but because of it's position above the levels gives fabulous views up and down the coast and out to the Pyrenees. There is parking in Regencos, then it is a simple walk following the obvious track up the hill to the top of Quermany Gros. The path splits at the water-deposit and you take the left fork onto a smaller path that winds you around the hill to the top. 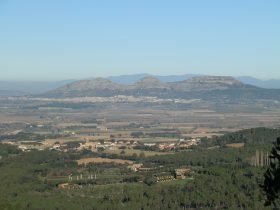 The path itself is not special (and on the way down will be rocky so it needs good footwear), but as you start to reach the top, the landscape around starts to unfold to give great views towards Begur, then the Isles Medes and up to Roses/Cap Creus, then across to Torroella and Montgris. 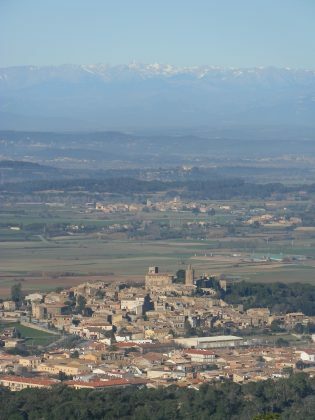 Then Pals and the villages of Peretallada, Palau-sator and Torrent and out to the mountains, and looking south across Palafrugell to the high-rises of Palamos and St Antoni de Calonge. All of the photos here were taken on the walk from the various viewpoints available. Once you've finished admiring the many views from Quermany Gros it's time to continue onwards. Below you, towards Pals, is another hill - this is Quermany Petit. As you head down follow the path signposted towards Pals. 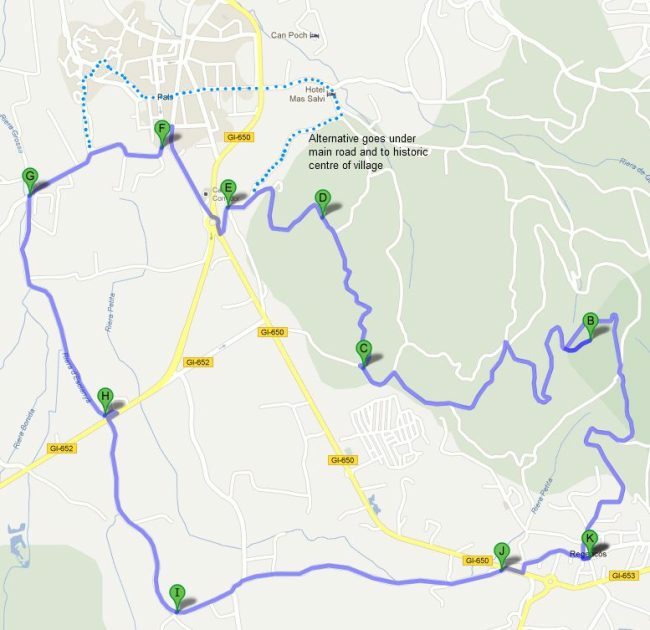 There are quite a few routes on the way down so diversions are possible, but it's also easy to take the wrong path and end up behind rather than in front of Quermany Petit. The route we took went to the left and then down to the campsite. As you pass the campsite - almost at the campsite edge with caravans below you - a path heads back up to the right. This takes you to Quermany Petit. The reason for going to Quermany Petit is because this gives the best view of Pals. If you judge the day right you get Pals standing off the plain with the snow on the Pyrenees directly behind the village. The path off Quermany Petit actually ends at the main roundabout on the way in to Pals village. This can be quite busy to cross. An alternative is to follow the path by the farm to the right which will wind around a little more until it meets a road that passes under the main Pals bypass and saves crossing the road. Obviously you can also stop and visit Pals, but on this occasion we carried on with the walk. To the south of the village is a broad gravel track which is used as a bike path (marked with brown signposts). It's an easy flat cycle if you want to explore the neighbouring villages. We follow the signpost directions towards Palafrugell which takes us down to the main Torrent-Pals road by the waterworks. This is also busy so care is needed crossing. On the other side you pass open fields and a couple of pig farms before turning towards a farm and a cross-roads. At the cross-roads Regencos will be sign posted and you can walk back to the village.